Cubitainers are standalone containers that are flexible and easy-to-handle. Along with the significant performance, it also offers cost and environmental benefits for transport, storage and dispensing of liquids. Cubitainer is witnessing demand, on the back of factors like changing food habits, lifestyle pattern, cost-efficiency and its environmentally friendly nature as it is reusable and recyclable. Cubitainers are majorly being manufactured using Low Density Polyethylene (LDPE). Despite facing competition from polymers, LDPE is witnessing an increasing use as it is recyclable, available at low cost, and has moisture and chemical resistance. Also, cubitainers are compact when empty making it easy to transport to the remote sampling site. Collapsible cubitainers are also gaining traction in the market. As it is a liquid container that combines cardboard with the flexible plastic container and continues to lead due to a wide range of applications including food, industrial chemicals, pharmaceutical products, dairy products, etc. 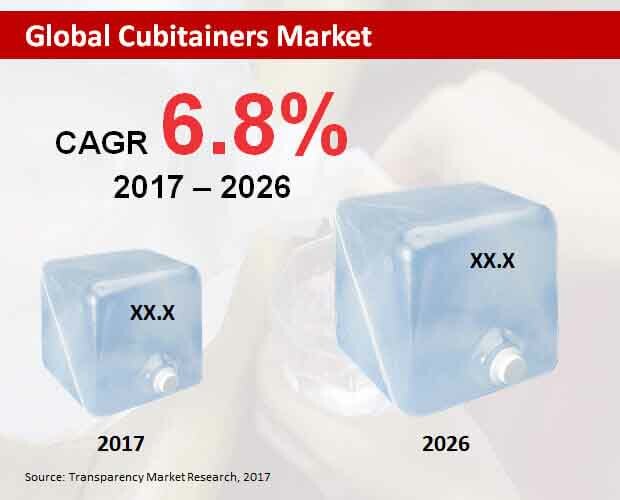 A new report by Transparency Market Research (TMR) expects the global market for cubitainers to experience robust growth, expanding at 6.8% CAGR during 2017-2026. The global market for cubitainers is likely to reach US$ 150.0 million revenue by 2026 end. Compared to the High Density Polyethylene (HDPE), Low Density Polyethylene (LDPE) is likely to witness significant growth between 2017 and 2026. Low Density Polyethylene (LDPE) is projected to generate revenue of more than US$ 100 million by 2026 end. Owing to the various advantages such as low cost, impact resistance, chemical and moisture resistance, and being readily processed by thermoplastic methods the LDPE is being used on a large scale in the manufacturing of cubitainers. Cubitainers with 3 liters of capacity is likely to be among the most preferred cubitainers. By 2026 end, cubitainers with 3 liter capacity is projected to surpass US$ 50 million revenue. 3 liter capacity of cubitainers are used on a large scale in various industries as they are easy to handle, ship and pour. Food & beverage industry is likely to emerge as one of the largest users of cubitainers. Witnessing a robust growth, food & beverage industry is likely to create an incremental opportunity of more than US$ 20 million between 2017 and 2026. In the food and beverage industry cubitainers are largely used by alcoholic drinks and energy drinks producers. It includes packaging of shake, liquid sugar, mirin, wines, and other liquid foods and beverages. Europe is likely to be the largest region in the global market for cubitainers. The region is mainly driven by manufacturers preferring cubitainers especially for packaging various liquids. Meanwhile, North America and Asia Pacific Excluding Japan (APEJ) are also anticipated to grow significantly in the near future. China is likely to witness the highest growth, as it is the biggest exporter of cubitainer containers. Changshun Plastic Co. Ltd, Zacros America, ChangZhou HengQi Plastic Co. Ltd, Changzhou Sanjie Plastic Products Co., Ltd, The Cary Company, Thermo Fisher Scientific, Quality Environmental Containers, Berlin Packaging, Avantor Performance Materials, Inc., and Cole-Parmer, are some of the prominent players operating in the global market for cubitainers. Cubitainer is the highly preferred packaging solution for liquid products. Plastic cubitainers are being used on a large scale across the globe due to its lightweight and 100% recyclable quality. Cubitainers protect the product from gases, odor, bacteria and moisture. The market for cubitainers is anticipated to witness growth in the coming years. Its eco-friendly nature and reusability are also contributing towards the market growth. With the industrial revolution, manufacturers are focusing on including smart manufacturing processes, artificial intelligence, robotics, and internet of Things (IoT). Changing lifestyle and food habits is resulting in the increasing use of packed liquid foods, thereby driving the demand for cubitainers. There have been a number of regulatory programs introduced globally to reduce use and disposal of various packaging materials. Hence, research is being conducted by leading players to use eco-friendly packaging material. The report on the global cubitainers market includes an overview of the market, analyzes global market trends, and includes key market segments. The report also covers strategies employed by the leading market players. It also offers profiles of the leading players in the market. The report also provides current market scenario and growth prospects of the global market along with the market size, revenue generated, CAGR, year-on-year growth, etc. The report has been prepared on the basis of in-depth market research. Both primary and secondary research was conducted to offer key insights on the market. Primary research included important inputs from industry experts. While the secondary research included data from annual and financial reports and investors presentation. The report comprises of qualitative and quantitative data based on the micro and macro-economic factors. The report also provides details on the market dynamics including major trends, market drivers, opportunities in the market and factors hampering market growth. Porter’s five force analysis and SWOT analysis was also done to provide in-depth information on the market. Market attractiveness analysis was also done to help in identifying opportunities and make investments accordingly. Absolute dollar opportunity is also given in the report as it is considered to be an important factor identifying market growth. The report also includes a discussion on the leading players in the market. In order to provide a clear picture of the leading companies, the report offers company overview, financial overview, latest developments, key strategies including both long-term and short-term, and product portfolio. The report also comprises information on various regulations, advancements in technology, and new techniques adopted by the leading players in the global cubitainers market. The global cubitainers market is segmented on the basis of material type, capacity type, end users, and region. By material type, the market segment includes Low Density Polyethylene (LDPE) and High Density Polyethylene (HDPE). On the basis of capacity, the segmentation includes 1 liter, 3 liter, 10 liters, 16 liters, and 20 liters. By end users, the market is segmented into food & beverage industry, chemical industry and pharmaceutical industry. The global market for cubitainers segmented on the basis of region includes Europe, Japan, Asia Pacific Excluding Japan (APEJ), North America, the Middle East and Africa (MEA), and Latin America. The report also comprises details on the leading market players in the global cubitainers market such as Zacros America, Changshun Plastic Co. Ltd, ChangZhou HengQi Plastic Co. Ltd, The Cary Company, Changzhou Sanjie Plastic Products Co., Ltd, Thermo Fisher Scientific, Avantor Performance Materials, Inc., Quality Environmental Containers, Cole-Parmer, and Berlin Packaging.